This post should be read in conjunction with the post that came out an hour ago: Dogs and Learning. It was first published on Learning from Dogs on March 19th, 2014. 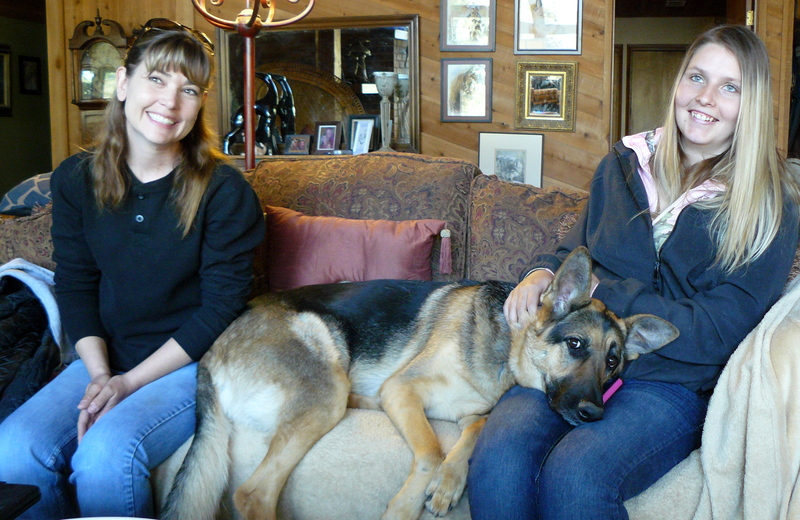 Cleo between guests Darla and Cody- picture taken yesterday (March 18th, 2014). Where to start this story about Cleo? I guess by going back to the days when I was living in the village of Harberton, near Totnes in South Devon, England. That means going back to 2003, the year when it seemed the right time for me to get a dog. 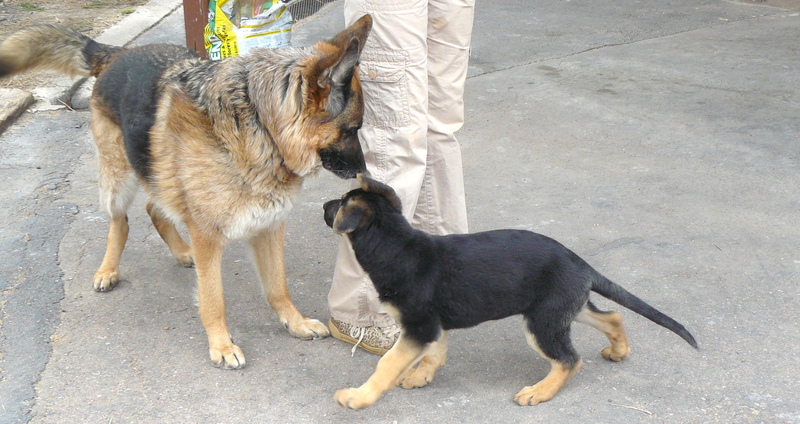 (Jean and I first met in December, 2007) There was always only one breed to be considered; the German Shepherd dog. Thus that desire for a German Shepherd led me to Sandra Tucker who lived not too many miles away who owned the GSD breeders Jutone. It was at Jutone where I saw the wonderful puppy dog who became my Pharaoh. But Sandra did better than breed the dog that has meant more to me than words can ever describe, she gave me some fantastic advice. That being that when Pharaoh was getting on in life, then bring in a German Shepherd puppy. There were two solid reasons why this made sense. The first was that Pharaoh would teach the new puppy many of the skills and disciplines that Pharaoh had learnt as a young dog and, secondly, the puppy would keep Pharaoh active. First picture of what was to be our puppy – 4th April, 2012, just two days before we brought her home. Cleo was born on the 23rd January, 2012. At that time we were still living down in Payson, Arizona. Right from the start she was, and still is, the most joyful, loving dog one could imagine. That top photograph shows in her eyes the openness of her heart and soul. So here we are coming rapidly up to the two-year anniversary (6th April, 2014) of when Cleo entered our lives. Cleo continues to be the most loving, gentle, sweet German Shepherd. However, as Sandra so correctly predicted, Pharaoh has ‘taught’ Cleo a number of commands such as Sit, Stay, Lie Down, Come, and more. Not a minute’s training of Cleo has come from Jean and me. Cleo is very fond of Pharaoh and it’s obvious that Pharaoh gets a huge amount from having Cleo around him. Fast forward to now, as in January, 2017, and the relationship between Pharaoh and Cleo is still incredibly important. Cleo senses that Pharaoh is in the last ‘phase’ of his life but still shows him incredible respect. Cleo is a very intuitive dog who appears at times to really understand what Jean and I are talking about, even when it has nothing to do with dogs. For instance, Cleo knows when I am finishing up my lunch and that the next thing that will follow is Jeannie and me taking the dogs out for their afternoon walk. Cleo is almost certainly the most knowledgeable and obedient of all of our dogs and it’s all down to Pharaoh’s skills as a teaching dog. What amazing animals they are! 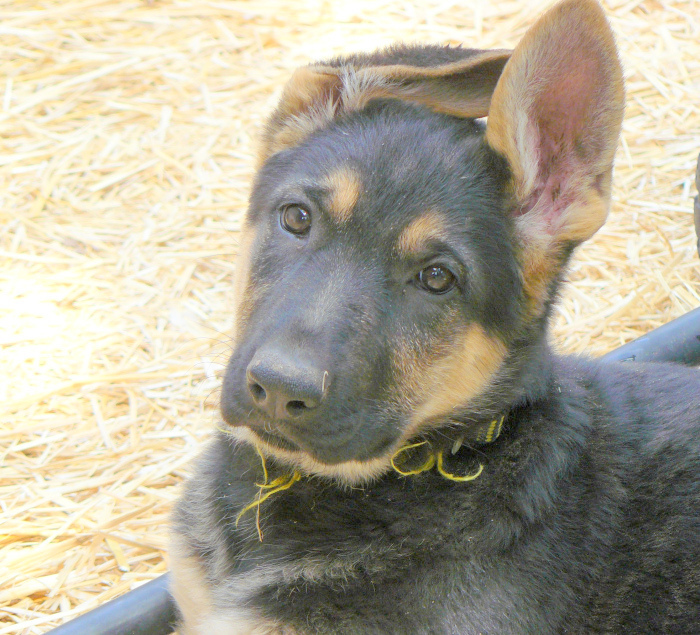 I have had German Shepherds too and I love to work with them. I got my Odin here in Spain. He is a mix of mother, German Shepherd and father, Labrador plus maybe Rottweiler, I don’t know, but he is extremely strong. I do have challenges with him, because he has been attacked by other dogs, while being walked in leash. This does now give me great challenges, special when we meet other dogs. Irene, it just crossed my mind as to whether or not you wanted to reach out to Angela Stockdale of The Dog Partnership? I would be happy to call her on your behalf. Thank you Paul for your kindness, but I live in Spain, so not so easy. Understood. Just didn’t like the idea of you dealing with that for the rest of Odin’s days. I would like to get help for him Paul, but here people don’t see the importance in dogs socializing with each other, which makes it a bigger challenge. I know, it would help him to get more friends, but when we meet the few friends, as he has, they are only allowed to play for max. 5 minutes, which is not enough. I have been training dogs in Denmark together with the police years ago and this was very good training and a lot of playing for the dogs too, which help all to socialize much better. Thank you for your offer, but I think, that I need to stay there to get this help. Please don’t hesitate to come back to me if you would like to speak with Angela. If you think, it can help us, even the distance, I would like to talk to Angela, Paul. Thank you. I have sent Angela an email. Thank you. The same wishes sent in return. Beautiful dogs Paul. It’s a pity that many people are so wary of German Shepherds. Is it because of their size? My guess is that it is because German Shepherds are so often trained to be police and security dogs. That’s also frequently how they are portrayed in film and television. Just a guess. This is so true, Paul! When our Lab Melanie, was in the last phase of her life, we found Abby. Abby’s playful nature was exactly what Mel needed to keep her sharp & active. Everything Abs learned she acquired from Mel. I guess that comes about because of the inherent pack instinct where each member has a function. Yes. Plus I think the adult dogs instinctively know that befriending a young dog, including mutual play, is beneficial for the younger dog in terms of developing a close relationship with his adult family. Don’t know why it comes to my mind, for it may be rubbish, but it struck me that there’s frequently a lovely relationship between adults and their grandchildren. Just curious if that was driven by the same purpose in protecting, caring and loving one’s own family first and foremost. More than likely it is the familial preservation instinct like you stated, Paul. I think it is spot on! A great post! Dogs do learn from each other- just as humans learn by observation. I’ve seen it in some of my dogs but I have two that are strong willed and like to do their own thing.. But for the most part they are obedient and follow the lead of the elder and or larger dogs. I’m certain you are right. Pharaoh is really a very old, weak and wobbly dog but he still commands something over the other dogs that one sees clearly even though it’s difficult to put precisely into words. Have you investigated laser yet: And acupuncture? It s well worth a try to extend his life. No, not yet. Your reminder is timely. For I will telephone Jim Goodbrod this morning and seek his guidance as to where to find these treatments. Jim is a neighbour and our local veterinarian doctor. I really hope that Pharaoh can be helped. Have you upped the dose of hemp? I had to do that with my dog that is 12-13 years old. (I doubled the dose in fact. He is a border collie x Australian sheep dog. My smartest dog. They certainly are the most wonderful of animals. Your dogs are beautiful. Thank you so much, Barbara. Yes, we think, sorry we know, our dogs are very beautiful indeed. Means a lot to read what you wrote. For Yvonne of PetsPeopleandLife, and everyone else. This is a follow up from the query earlier about laser treatment or acupuncture to help restore better mobility in Pharaoh’s rear hips. Jim Goodbrod said that both treatments, especially acupuncture, can be useful for reducing pain. But in Pharaoh’s case he has no pain. His difficulty arises solely from muscle wasting, a product of his breed and his age, and there is nothing medicinal that will alleviate that wasting. Jim did add that Pharaoh, now thirteen-and-a-half years old, is well over the average lifespan of a GSD of his size. Good diet, regular gentle exercise at the pace he chooses, and support from Jean and me is all that is required now. Love this post! I just posted about my dog. Been there are read your story and left a reply over on your place. Welcome to my place, by the way. They are a gorgeous breed aren’t they! Good read. Makes me think about how awesome/wonderful my GSD is also. Welcome to this place. Do share a link if you have a picture of your GSD over on your blog. Feel free to follow my little blog also.